If there’s one name capable of sending chills down the spine of Queen Elizabeth II, it is Wallis Simpson’s – the Duchess of Windsor – who in 1936 rocked the royal family by her love affair with the then Prince of Wales, Elizabeth’s uncle. Barry Everingham comments. It might well be asked if the release of umpteenth biography of the duchess: That Woman: The Life of Wallis Simpson, Duchess of Windsor – and so far the most revealing – was to coincide with the visit. Before continuing, some background for our younger readers. The man Wallis loved was the eldest son of King George V and Queen Mary — two unbending and stitched up people who should never have had children, but they did: a daughter and four sons. Wallis’s lover was the eldest – David, the Prince of Wales – who became King Edward VIII, his next brother, Bertie, who became King George VI (and the father of Queen Elizabeth) and two other brothers Harry the Duke of Gloucester, an alcoholic, and George, the Duke of Kent, a bisexual drag-queen. Bertie, of course, was so traumatised by the attitude of his parents he developed a stutter, and was cured by the Australian therapist Lionel Logue. David was a philanderer who was attracted to married women, who he always left and moved on to another. But in 1935 he met Mrs Ernest Simpson, an American who had already been married and divorced which made her “safe” for David — or so the family thought. He became besotted by her, though it seems she was indifferent to him — well, until George V died and he became King. The establishment of the time and the Prime Ministers of the then Empire would not have a bar of her. A twice married woman with both husbands still alive sitting on the throne of England — no way! So, David came up with an idea. Knowing she would not be tolerated as Queen, he sought advice about what royals down the centuries had been doing to marry “unsuitable “ women — what they called “morganatic” marriages, where the woman is not equal in rank to her husband and their children, if any, cannot inherit dad’s titles. 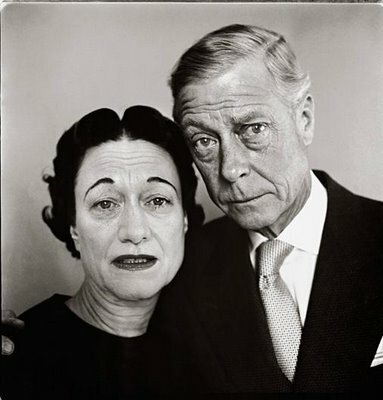 This wasn’t an option for David and Wallis — so he abdicated, was created Duke of Windsor and married his lover, who became Duchess of Windsor, but on the orders of the new King, George VI, Elizabeth’s father, was denied the title of “Her Royal Highness”, which was considered so mean, so petty and such a hard slap in the face that the editor of “ Burke’s Peerage”, the British bible of social rank, called it “the most flagrant act of discrimination in the whole history of our dynasty”. Moving forward to the present, the current Prince of Wales obviously had a huge share of his great Uncle David’s genes — Charles liked married women and had a mistress whom he eventually married. But, for once, the royal family learned a lesson from the past — well almost. Camilla was denied the title “Princess of Wales” but one of Charles’s subsidiary monikers was unearthed and she became HRH the Duchess of Cornwall in a "late light” morganatic way — with the rider that she won’t be Queen when he becomes King, but will be the Princess Consort. That of course is total crap — when Charles becomes King his ex-mistress will be Queen. Back to the Wallis biography. The woman was studiously ignored and treated abominably, by the Queen and most of her family, until she died a hideous lingering death in Paris and was then given a semi-royal funeral at Windsor Castle, during which the name of the dead Duchess was never once mentioned! The Duchess’ biographer, Anne Sebba, has unearthed some medical facts which may explain why Wallis looked so angular and, some say, masculine. It seems she never had periods and was an androgynous human being, which made the horror the royal family had of the couple ever having children totally baseless. Anne Sebba was, in my view, hard on the Duchess, who has been described by friends as a warm and caring woman. It is true she has become a footnote in history, but she carved a really wonderful niche all of her own. In an era when there will be no more kings or thrones, including hopefully Australia’s, the experience of Wallis Simpson is really unique. A crown, a sceptre, and a throne. Strewth, Turnbull the Placebo Flamingo of Australian politics! Who knew?